The Raccoon is considered a Canadian animal, mainly found throughout Southern Canada. As cute as it may seem, it is a wild animal, and when adjusting to city life – it doesn’t always get along well with humans and their needs… In our Sodding service work, we come across Raccoons often times, and we know, that underestimating its abilities can result in extensive damage. There is nothing worse than waking up in the morning, and seeing your beautiful new sod all rolled up. Except seeing it rolled up again the next day… Over the last two years, we were trying to find an appropriate solution to the issue – everything from pepper spray to wildlife removal services. We came down to a conclusion that Raccoon problem is complex but not without a solution. The key for resolving the problem is a close cooperation between us and our client, and the use of several methods, which could be built up gradually as the need grows (more relevant for new communities, with small Raccoon population) or a full-blown defense strategy deployed on the day when the new sod is installed (highly recommended for mature communities with large trees (Raccoons often live on trees) and with large Raccoon populations. Lighting up the area – 100 Watt bulb for every 250 square feet (motion detectors are great). Sprinkling pure soap flakes and watering thoroughly. Contacting Wildlife removal service (in extreme cases). Protective net is highly efficient in protecting the new sod from Raccoons. The one we use (and should be available in your nearest do-it yourself store) has a special structure making it difficult for Raccoons to walk on, never mind digging in (we peg the net to the ground with thick plastic and metal pegs, which require a bit more dexterity than the Raccoons are capable of. 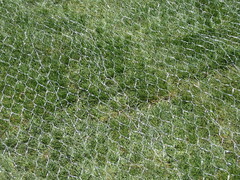 The net should stay on the grass until the first cut – about three weeks. By that time the roots should take in, and watering schedule greatly reduced. 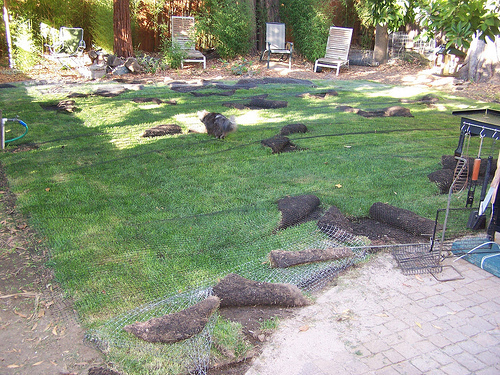 We strongly recommend our clients to do have us install the net on the day the sod is laid. Raccoons are nightly creatures, and as such they prefer to stay away from the light. Installing 100W light bulbs, or garden lights activated with motion-sensors is both economical (as the lights are not on all night long) and helpful. This is a powerful, portable, motion activated sprinkler. It does a great job scaring Raccoons and other wildlife away. Keep an eye on the edges of your lawn – the jet stream may be too weak if placed too far away, and will not deter Raccoons from munching on the edges of your sod. We are glad to deliver and install the Scare-Crow sprinkler on the sod installation day. It is also usually available in Canadian Tire and other hardware stores. A strong unpleasant scent goes a long way making your lawn less attractive in the eyes of Raccoons. Moth-Balls are not fail-safe, and are best used in addition to the above methods. We usually carry a little stock of Moth Balls in our truck, as they are inexpensive, and are a great tool we are glad employ in protecting our work. Pure soap flakes will help to reduce to worm and grub population and drive them below the soil surface. The further away they are from the surface – the less likely Raccoons are to sense their availability and go after them. Raccoons are a problem, but it is not impossible to drive them away. The methods described above designed to make your lawn less attractive and much less accessible source of food. Raccoons will strive to find an easier source of food elsewhere, allowing your fresh sod to take root, and grow uninterrupted! 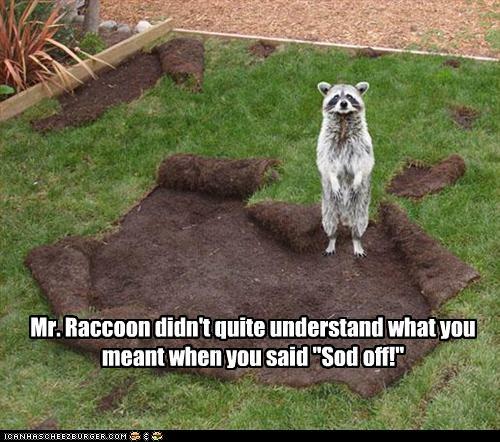 We are glad to inform our clients of Raccoon hazards, and equip them with the tools they need to protect their freshly installed Sod. We are glad to install the protective net, and bring the Scare Crow sprinkler with us, we can even drop a few moth balls where needed. Using other methods, like lighting up the area, or sprinkling soap flakes – is up to the owner of the new lawn to do, and is usually done only when a significant Raccoon attack takes place. Niko’s team did a fabulous job sodding our backyard after our [Toronto] house renovation. The [Sodding] crew came on time, worked diligently and were extremely thorough. The entire [Sodding] process was smooth and went like clockwork. The backyard now looks beautiful. I would highly recommend Niko’s Gardening.